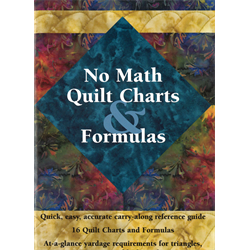 If you’ve ever wished for a quick, easy and accurate reference guide to determine how much fabric yardage you need for blocks, strips, squares, half-square and quarter-square triangles in a variety of sizes, here it is. Small enough to fit in your purse, big enough to contain a wealth of time-saving and useful information, No Math Quilt Charts & Formulas is a convenient and invaluable pocket guide for quilters. Use with confidence to answer sizing and measurement questions.